HOW FAR? Yorkshire Vikings return to Natwest T20 Blast action at Headingley on Friday night, beginning the 2016 campaign against Leicestershire Foxes. THERE’S a real mix on our latest CricketTalk podcast, as Chris Waters takes time out from his increasingly busy schedule to discuss the latest news around the county and international scene. 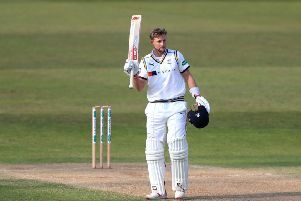 Friday night sees Yorkshire - under the guise of the moniker Vikings - begin their latest quest for Twenty20 success when they take on Leicestershire Foxes at Headingley in the first encounter of their natwest T20 Blast campaign. Will England's cricketers enjoy another comfortable encounter against Sri Lanka when the two teams reconvene at the Riverside on Friday? It’s a competition which has proved a frsutrating one for the county over the years, reaching finals day just the once since the shortest format of the game began back in 2003. Friday also sees the beginning of the second Test match between England and Sri Lanka, this time Chester-le-Street being the setting for what is hoped will be a more competitive meeting than last week’s Headingley Test match, which ended in just under three days with the hosts cantering to an innings victory. And, perhaps most importantly for Yorkshire’s members, Sunday sees Jason Gillespie’s team don their more traditional white flanels when they welcome fierce rivals Lancashire to Leeds for the first of two County Championship Roses battles of the year. Yorkshire, with one win from their first five games, will be looking to engineer some momentum into their four-day campaign as we approach the halfway mark.